AMMAN – Under the patronage of the Canadian Embassy in Amman, and the Honorary President HE Mr. Peter MacDougall, Ambassador of Canada to Jordan, with a strategic partnership with Talal Abu-Ghazaleh Organization (TAG-Org), Orange Jordan Company and the attending women from various sectors, the ‘Women in History Jordan/Canada Forum’ in its 3rd edition was launched. The Forum discussed different topics including the Economic and Political Aspirations of Women in Jordan and Canada, as well as their Prospects in the Film Industry, Media, and Social Networks. This year’s Forum shed light on a host of outstanding and prominent women who made history in their respective nations of Jordan and Canada, through a social media campaign documenting their accomplishments and serving as role models. Ambassador MacDougall stressed the importance of the forum in enhancing women’s rights and equality. 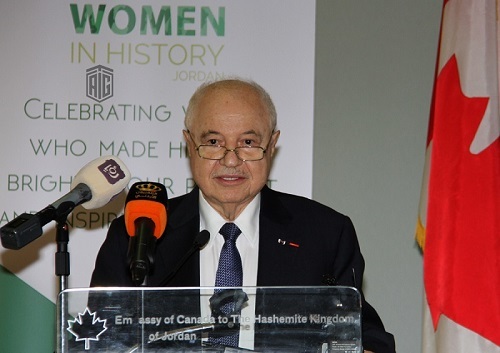 During the inauguration ceremony, HE Dr. Talal Abu-Ghazaleh, in his keynote speech, highly praised the initiative to honor creative Jordanian women, expressing sincere gratitude to the Ambassador of Canada for the support of his government to this project. 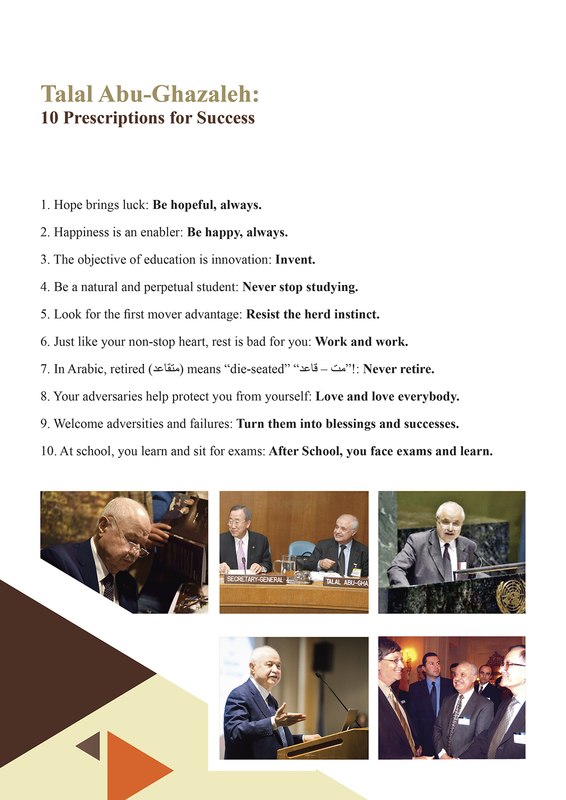 Dr. Abu-Ghazaleh also expressed hopes that in the era of the Fourth Revolution or so-called “Knowledge Revolution” the creativity and innovation of Jordanian women will be on equal footing with men in Jordan in the field of knowledge creation and entrepreneurship, noting that through absolute equality and full democracy on the Internet, there are no more excuses related to social obstacles and barriers. It’s noteworthy to mention that “Women in History Forum” is a Canadian initiative, transferred to Jordan by Film Maker Ms. Ghada Saba who founded its distinctive edition that contributes to cultural experiences and knowledge exchange attributed to the importance of women's role in the past, present and future. Among the speakers at the Forum were members of the Senate HE Ms. Haifa Al Najjar, HE Ms. Kholoud Al Saqqaf, Ms. Rula Nassar, Ms. Caroline Faraj in addition to a number of distinguished women from Canada including producer and journalist Ms. Tanya Goudsouzian, Prof. Basma Al Momani and the Chief Economist Marie-France Paquet. During the Forum, a strategic agreement was signed between Women in History Initiative and TAG-Org to participate in projects that enrich the initiative by enhancing women’s participation in the labor market, strengthening their role in decision-making and their impact on their country’s history, economy, heritage, culture and building the future, not only in Amman but in other governorates in the Kingdom. 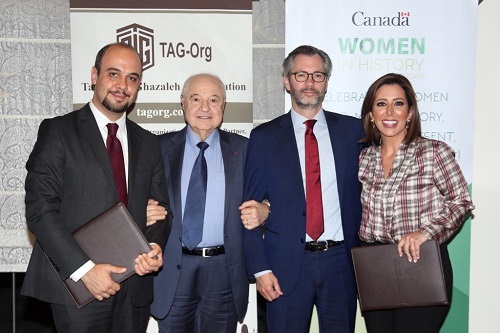 Furthermore, the partnership incorporates the hosting of events organized by Women in History Initiative at Talal Abu-Ghazaleh Knowledge Forum (TAG-KF), in addition to utilizing Talal Abu-Ghazaleh Knowledge Stations throughout the Kingdom to serve the objectives of the initiative in reaching local communities as well as providing TAG-Org's professional services.